As said in thiruvAimozhi 7.7.8 “kOLizhaith thAmarai” (the lotus eyes which have their own lustre as the ornament [in this pAsuram, nammAzhwAr enjoys the part-by-part beauty of the divine face of emperumAn]), ALavandhAr is enjoying the combination of the part-by-part beauty of the divine face. prabudhdha – Being well-blossomed due to the togetherness with his devotees. mugdha – In the starting stage of blossoming (very fresh) as said in thiruppAvai 22 “kingiNi vAych cheydha thAmaraip pUppOlE … am kaN iraNdum koNdu” (like a lotus flower which is blossomed a little bit, like the opening of ‘kingiNi’ (metal ball with openings like a half-open flower, with a metal ball inside it to make noise when shaken) … with those two beautiful eyes). Also explaining the change in his face due to the great bliss as a result of being together with his devotees as said in thiruvAimozhi 9.10.9 “pEdhuRu mukam seydhu” (showcasing his attachment in his face). ambuja chAru lOchanam – As the example is no match for the original [eyes], now, ALavandhAr is directly saying the eyes. 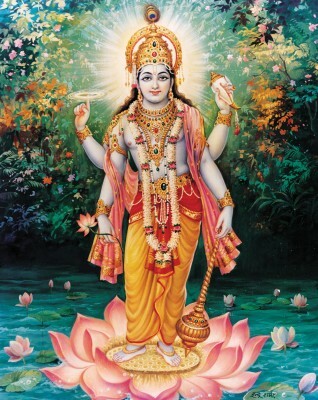 SrIvishNu purANam 5.17.4 akrUra’s words “… thath puNdarIkanayanam vishNOr dhrakshAmyaham mukham ||” (The divine face which will remove the sins of those who think of it, that which is present as per the will of his devotees, that divine face of vishNu which has the lotus-eyes, I am going to see that). savibhrama bhrUlatham – You who have curved eye-brows which reveal his full attachment towards his devotees as said in thiruvAimozhi 7.7.4 “manniya sIr madhanan karuppuch chilai kol” (Cupid who has eternal beauty). His bow is cited as an example for his eye-brows as in nAchchiyAr thirumozhi 14.7 “than kaich chArngam adhuvE pOl” ([his eye-brows] which resemble his bow, SArnga). ujjvala adharam – You who has very beautiful lips as said in thiruvAimozhi 7.7.3 “vAliyadhOr kanikol” (is this a distinguished fruit? ), thiruvAimozhi 7.7.3 “kOlam thiraL pavaLAk kozhum thuNdam kol” (Is it a piece of coral which has abundance of beauty etc) and thiruvAimozhi 7.7.3 “neela nedu mugil pOl thirumEni ammAn thoNdai vAy” (the mouth of emperumAn who is having dark-cloud like divine form). Suchi smitham – Having divine smile as said in periyAzhwAr thirumozhi 1.5.9 “pavaLachchendhuvar vAyin idaik kOmaLa veLLimuLaippOl sila pallilaga” (in between the reddish lips, divine teeth which appear like silver coloured pearls) and thiruvAimozhi 7.7.5 “en Avi adum aNi muththam kol” (is it his divine teeth-line which kills me?). kOmaLa gaNdam – You who is having a beautiful neck which attracts those who enjoy you. unnasam – Having creeper like nose as said in thiruvAimozhi 7.7.2 “mAttuyar kaRpagaththin valliyO kozhundhO” (is the nose a shoot or creeper of kalpaka tree [near those eyes]?). lalAta paryantha vilambithAlakam – Having divine curly hairs that lean down to the forehead as said in periyAzhwAr thirumozhi 1.5.5 “munna mugaththaNiyAr moy kuzhalgaL” (very beautiful dense curly hairs which fall on the forehead) and periyAzhwAr thirumozhi 3.6.9 “suruNdiruNda kuzhal thAzhndha mugaththAn” (one who is having a face where curly, dark divine hairs fall [in the forehead]). In the back, it is as said in “amsa vilambi” and in the front, it is “lalAta paryantham“. Slokas,meaning,commentary are all very neatly provided to understand the Supreme Lord.Thanks.